A new pay structure for teachers will ensure part-time teachers are paid for all the hours they put in. The recommendations will see part-time teachers receive the same contractual conditions as full-time colleagues. This means the 93,000 part-time teachers in England and Wales will be paid for work done outside class, such as marking and lesson preparation. The proposed changes to teachers' pay and conditions were announced by the Education Secretary, Alan Johnson. The recommendations, based on advice from the independent School Teachers' Review Body (STRB), are designed to make sure teachers' wages "remain competitive and attract the best candidates". The plans include financial incentives for teachers who complete accredited qualifications in priority subjects and increasing use of existing local "flexibilities" to reward teachers. Teachers who progress along incremental pay scales must have a performance management review and a teacher's performance must satisfy explicit performance-related criteria. Mr Johnson said: "Teaching is both a challenging and rewarding job and it's right that we recognise this in the pay and conditions that we give them. "We have increased pay by 18% in real terms since 1997 to reflect this. "It is vital that we continue to offer a competitive package in a strong economy." The recommendations were welcomed by the Association of School and College Leaders. "The proposals will contribute to the further development of performance management in schools and to the internal consistency of the teachers' pay scheme," said general secretary Dr John Dunford. Chris Keates, general secretary of the NASUWT, said: "We will now have parity of pay and conditions for part-time teachers. "Thousands of part-time teachers will now have access to all the contractual conditions of their full-time colleagues and there will be a standard national formula for calculating their pay." 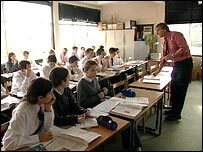 The National Union of Teachers said the unions' campaign for fair treatment of part-time and supply teachers was "paying off". But the Association of Teachers and Lecturers was less enthusiastic. "We have still got a long way to go to achieve fair and transparent pay and conditions for all teachers," said general secretary, Dr Mary Bousted. "We also need much a much clearer and more precise statement of teachers' professional duties with an emphasis on teachers teaching and learning, as the current statement is out of date and no longer fit for purpose."